Retired Command Sgt. Maj. Robert "Bob" Gallagher would have served 20 more years in uniform if they had let him. Gallagher – who parachuted into Panama during Operation Just Cause, served as a platoon sergeant with Task Force Ranger in the Mogadishu, Somalia, battle made famous by "Black Hawk Down," and fought on despite being wounded as Task Force 3rd Battalion, 15th Infantry, made its way to Baghdad in 2003 – passed away Oct. 13 from a heart condition. He was laid to rest Monday at Arlington National Cemetery. "If there was a 50-year limit, Bob would have stayed until the very last minute," said his wife, Denene Gallagher. "He stayed in for 32 years, and a few months after retirement, his heart gives out. It just seems to me like once he left the military, his heart broke because he lost his calling." Bob Gallagher was 52 years old. Robert Gallagher when he was on duty. He retired as a command sergeant major. On Monday, under a clear blue sky, more than 200 mourners walked in step behind the caisson bearing Bob Gallagher's cremains. As the bugler sounded "Taps," soldiers, young and old, from almost every period of Bob Gallagher's career, snapped to attention. "I can't put into words the loss of Bob," Denene Gallagher said. "There's really nobody to replace him. He was a natural born soldier. He loved soldiering, he loved the brotherhood, being out there in the dirt and the mud." Bob Gallagher's imprint on his soldiers' lives was evident this week, as those who fought alongside him in Mogadishu and later in Baghdad, and those he helped near the end of his career through the Army Wounded Warrior Program came together to celebrate his life. "Bob was just a great professional," said Larry Moores, who was the platoon leader to Bob Gallagher's platoon sergeant in 3rd Battalion, 75th Ranger Regiment during the Battle of Mogadishu. "He was a hard worker, always committed to taking care of soldiers." Moores, who retired in 2003, used to have lunch with his old platoon sergeant every month after Bob Gallagher got stationed in the Washington, D.C., area with the Army Wounded Warrior Program. "Bob was tremendous at what he did," Moores said. "There are very few people as committed to taking care of soldiers and their families as Bob Gallagher." Bob Gallagher was a genuine soul who had a knack for connecting with others, said Sean McCarthy, who works with wounded warriors on Fort Belvoir, Virginia. "He wasn't about being a sergeant major," McCarthy said. "He was about being Bob and taking care of his soldiers." 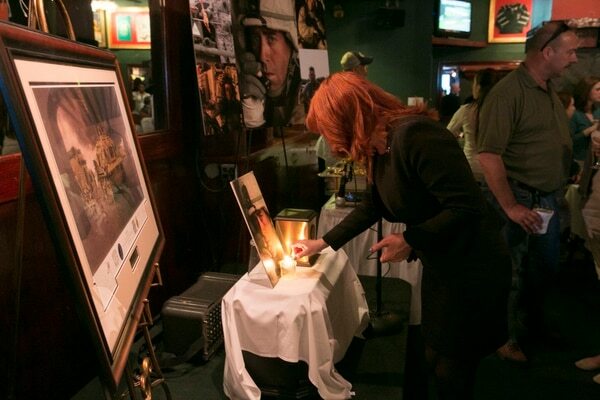 Denene Gallagher lights a candle next to the urn containing the remains of her husband, retired Command Sgt. Maj. Bob Gallagher, at Murphy's Grand Irish Pub in Alexandria, Va., on Sunday. Sgt. Maj. Patrick Fatuesi, who succeeded Bob Gallagher as the senior enlisted soldier for the Army Wounded Warrior Program, helped take care of him after surgery on his hip. "His whole life was the Army," Fatuesi said about his friend. "For him, he was down there on the line. He was always dirty. If you'd ask him 'where have you been?' He'd say 'I was with my soldiers.' "
Fatuesi regarded Bob Gallagher as his mentor. "I didn't think I'd learn much more after 30 years [in the Army], but he taught me a lot," Fatuesi said. "He taught me about being a soldier's leader. If they give out doctorates for being a soldier, he'd get one." For Jake McLaughlin, Bob Gallagher was a larger-than-life command sergeant major who led him into combat during the early days of the war in Iraq. "There wasn't a better leader we could've had, there wasn't a better sergeant major we could've had," said McLaughlin. Angel Acevedo, who also served with Bob Gallagher and McLaughlin in 3rd Battalion, 15th Infantry Regiment, agreed. "He taught us, he trained us, he took care of us, he loved us," Acevedo said. "There's not a day that goes by that I don't think of him. I'm a better man because I met him." Hearing his father's soldiers and peers share their stories has helped Patrick Gallagher, the oldest of Bob Gallagher's four children. "I never saw the military side of him," said Patrick Gallagher, 23. "Whenever we were together, he was a real down-to-earth person. I saw the dad side of him." The pair would often go biking or kayaking, and his father loved to take photos. But he also never bragged about his awards or achievements, Patrick Gallagher said. "He never wanted to make a big fuss," he said. "I love my father being the person he was, but hearing the stories has been wonderful." Denene Gallagher said the family has been buoyed by the outpouring of support since her husband's death. "Never in a million years would anybody believe that a little boy born in New Jersey would grow up to join the military and touch so many people's lives, mend so many broken hearts, heal so many people," she said. Jake McLaughlin shared a memory of the late Command Sgt. Maj. Robert Gallagher during a celebration of Gallagher's life at Murphy's Grand Irish Pub in Alexandria, Va., on Sunday. McLaughlin served with Gallagher in A Company, 3rd Battalion, 15th Infantry Regiment during the invasion of Iraq. To honor her husband, Denene Gallagher is raising money to pay for a bronze statue of him that she hopes will one day be on display at Fort Benning. "I want him to be memorialized because, in my eyes, he was a hero," she said. "So when the young Rangers or recruits, as they're entering the building, they can look at him, and they have someone to look up to, someone who set the bar." This effort also helps her stay focused, said Denene Gallagher, who has created a GoFundme page for the effort. She's also posting updates on Twitter. "Bob was my battle buddy, and now there's this huge hole in every day and every minute and every hour. If I can have just one thing to focus on to accomplish, to do in his honor, that's my purpose here now. That's just what I want to do." Bob Gallagher was born in Toms River, New Jersey, in 1962. He joined the Army as an infantryman, completing his training at Fort Benning, Georgia, in 1982, according to his bio. As a squad leader in 1989, he led Rangers from 3rd Battalion, 75th Ranger Regiment in the night combat parachute assault at Rio Hato Military Airfield, Panama, and subsequent missions during Operation Just Cause. Just four years later, he led Rangers into battle once again, this time during Operation Gothic Serpent in Mogadishu. Bob Gallagher would go on to serve in combat at least two more times in support of Operation Iraqi Freedom. He earned a Silver Star, two Bronze Stars (one with "V" device) and two Purple Hearts, among other awards and decorations. Sgt. 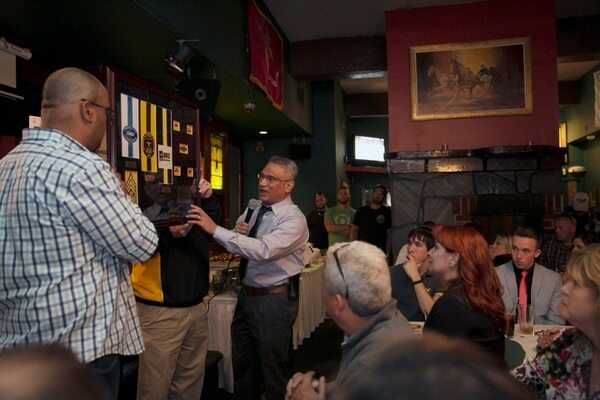 Maj. Patrick Fatuesi presents a plaque to the family of retired Command Sgt. 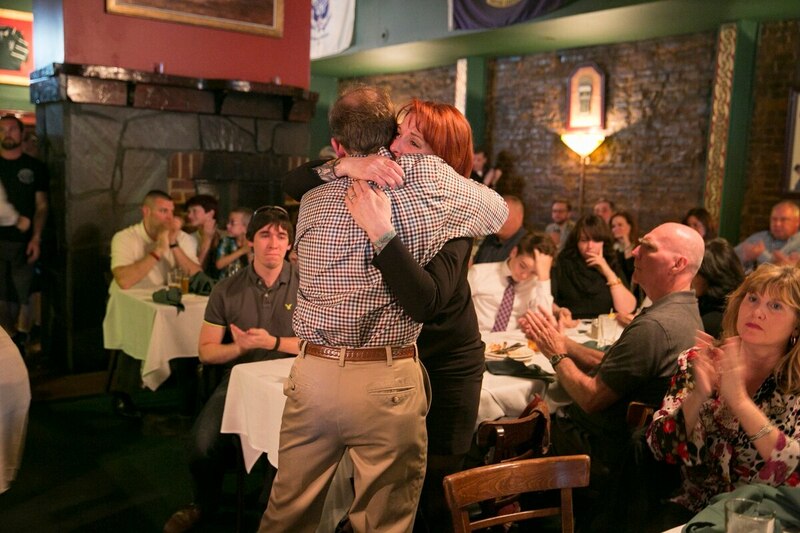 Maj. Robert Gallagher during a celebration of his life at Murphy's Grand Irish Pub in Alexandria, Va., on Sunday. Gallagher, 52, who died in October, 2014 and fought in Panama, Somalia and Iraq, was buried at Arlington National Cemetery. The Silver Star came in 2003 for his actions during OIF, in which TF 3-15 Infantry advanced from Kuwait to Baghdad, often fighting its way through fierce Iraqi resistance. Gallagher gave a speech to his unit before the fight began, turning to unit commander Lt. Col. Stephen Twitty with a simple message, according to a 2003 Army Magazine article: "Sir, we are prepared for battle." Gallagher suffered a leg wound during the fight but continued directing his men. It wasn't his first battlefield wound, having been shot in the arm in Somalia in 1993, according to one of the Philadelphia Inquirer pieces written by Mark Bowden that would become the basis for the "Black Hawk Down" book and movie. "The best day and the worst day of my life was when I served in Mogadishu, Somalia, on October 3, 1993, as a part of Task Force Ranger," Gallagher said in a 2010 interview published as he took over his post at the Wounded Warrior Program. "It was the worst day, because we lost 18 Soldiers and 84 others, including myself, were wounded. It was the best day of my life because it showed the incredible performance of our warriors in long-protracted battle under extraordinary circumstances in an urban environment. Throughout it all, the warriors that fought that day performed in a manner that was consistent with the values of our nation, and I was very proud of that." Bob Gallagher is survived by his wife, Denene, and four children, Patrick, Sean, Kacy and Adikan. Staff writer Kevin Lilley contributed to this report.